The biggest event in mixed martial arts history was marred by shock upsets, retirement sagas and an extremely late USADA drug test blow, but when the T-Mobile Arena presented the Octagon for the very first time, UFC 200 delivered. Two new champions were crowned, as Brazil's Amanda Nunes and Jose Aldo produced fine performances to topple their American foes, while one of the biggest combat sports stars Brock Lesnar made a triumphant return. Anderson Silva, among the sport's greatest, was smothered by Light Heavyweight Daniel Cormier, with the list going on as part of a mouthwatering assembly of matchups. In the preliminary cards on Fight Pass and television, three first-round knockouts kicked off the night before some closely contested decision wins. With such a stacked card, the argument that some of the fights could have been moved to fight night main events were viable, as many fight tactics were cancelled out if not nullified over the course of three rounds. Jim Miller scored a first-round TKO win over Takanori Gomi, in a fight which showed the huge chasm in grappling skills between the two fighters. The Japanese PRIDE legend did look dangerous on the feet, preparing to load up, and Miller's constant head movement showed he was aware. But as soon as one kick was caught - a lethargic left kick to the thigh - the fight was as good as over. Miller easily dumped his opponent to the ground, where he prepared for an onslaught by turning to his side straight away. That made it incredibly simple for Miller to find the body hooks, taking his back for a rear-naked choke attempt. Credit where its due, the veteran did well to defend the submission attempt, but by doing so opened himself up to going underneath in the back mount, allowing the American to posture up and hammer away. 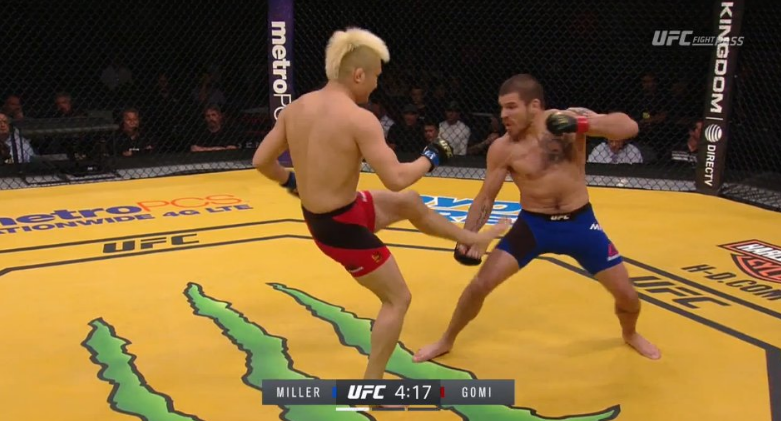 Again, the posture of Gomi spoke volumes, guarding up and preparing to take the shots, prompting the referee to call it off. Having performed at UFC 100, he certainly showed an evolution and a great display of longevity a few years on from one historic event to another. Gegard Mousasi rightfully walked away with a Performance of the Night bonus as his striking and mat abilities combined for an emphatic victory over Thiago Santos. He approached the fight and took the centre of the Octagon again with a relaxed stance, but soon got his hands up in a sign that he would begin to attack his opponent more. The increase in aggression will put some middleweights on alert, as he continued to press forward and rock his opponent, before pouncing with a series of significant shots as he backed his opponent up - a right uppercut and hook were most notable as he sent his opponent crumbling to the canvas. 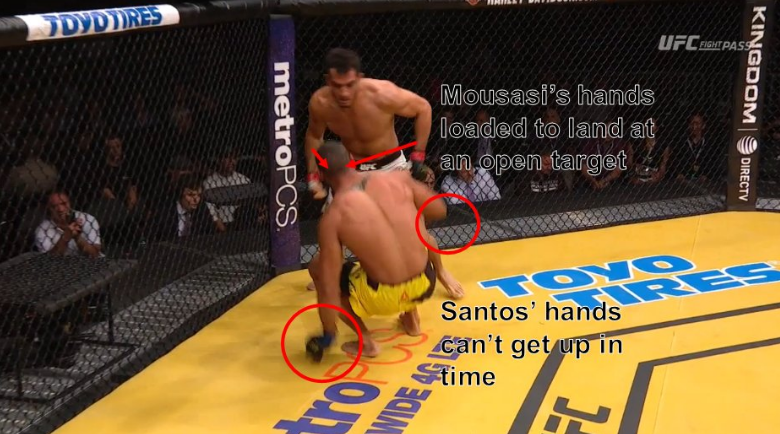 Some following up strikes in the back-side control allowed him to take Santos' back, where more damage would be done. His pressure in side control must have taken lots out of the gas tank of the 15th ranked 185 pounder, with the legs being pressed down on the mat to apply even more downwards force. Santos did well to get it back into full guard after some defence, but when Mousasi was stood back up after the being pushed up by a foot, he made a major procedural error. He decided to get back up straight away, exposing him immediately with his hands down to get him off the ground, allowing Mousasi to land a clean right hand and drop him, following up with strikes to finish it off. In the featured fight pass preliminary bout, Joe Lauzon became the first man to stop Diego Sanchez with strikes as he dispatched his durable chin in less than 90 seconds. Fired up as ever, Sanchez came out with a body kick and hard leg kick, but would soon surrender central position to Lauzon, who applied pressure and found the mark on multiple occasions. He threw wildly when he backed his opponent up, dropping him after a huge right hook and elbow, managing to counter his grappling and land an uppercut as he got back up. Sanchez's legs were gone as he tried to get his bearings back, but Lauzon wouldn't let up - a straight right putting Sanchez out and then another one knocking his gumshield out. Somehow, the Jackson-Winklejohn representative was able to continue, but the referee would deem enough when he nailed another right hand. It was a display of pin-point striking, and one that warrants all the credit; putting away someone with such a legendary chin. 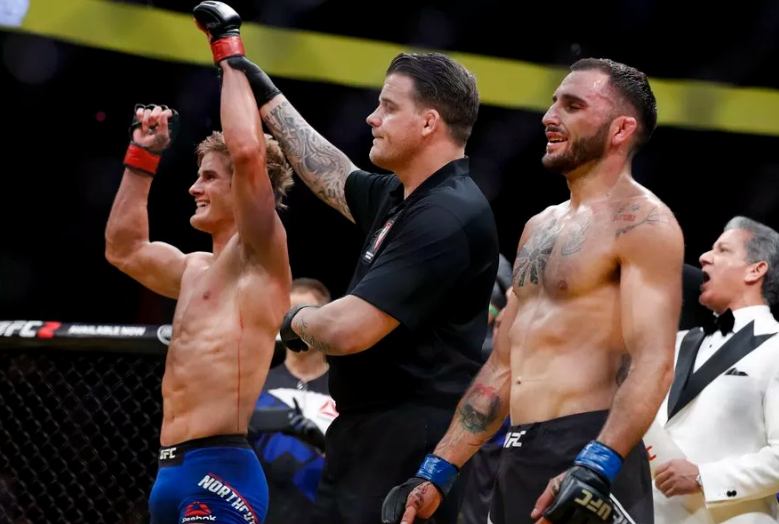 Sage Northcutt opened a televised prelim portion of the card full of decisions by surviving the submission attempts of Spaniard Enrique Marin, although the 20-year-old prospect showed he still had plenty to work on. When the fight was on the feet in the early stages, Sage employed his usual wide stance, bouncing and coming in to land ambitious shots, such as a left high kick and flying knee. Marin soon quelled his momentum with the double under-hooks, pressing him against the cage, before lowering to land a double leg takedown. 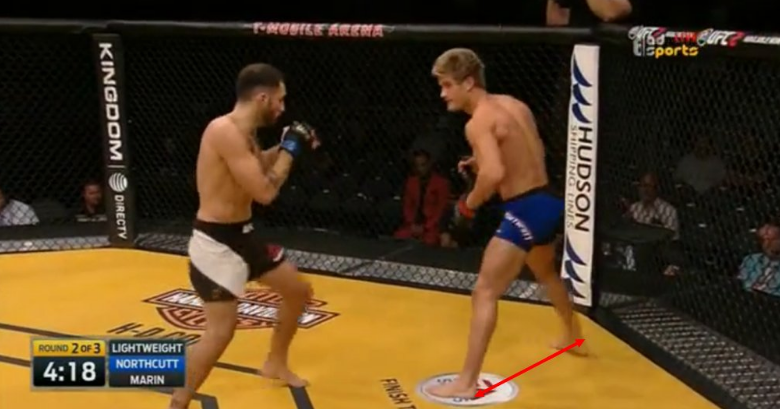 He looked for a leg lock but Northcutt was able to escape, and eventually take his back, where he landed some damage. Control wouldn't last long for him on the mat though, as he was again pressed up against the fence on the clinch. While the American would shoot again, it was the European who reversed it to getting back on top. The star of Dana White's "Looking for a Fight" was his own worst enemy at times, as was the case with the opening minutes of the second round. He had great success in striking range, landing some hard jabs and leg kicks, before initiating a grappling sequence which wasn't well executed and ended with him on his back. Marin managed to work his way around a half-attempt at a submission to the north-south position, before going in at a side and grabbing the arm, overcoming his opponent's resistance to lock it in. Northcutt demonstrated resilient defence though, as Marin couldn't really apply the damage, stepping in and managing to safely get out, a close call nonetheless. Just as he was in the full guard, he was reversed again and almost put in another armbar position, but "Super" Sage managed to survive and fire away in the same position again. A majority of the third round action involved Marin looking to take Northcutt down as he pressed up against the fence, but to no avail. While the American did struggle to stuff the takedowns, he did enough damage by reversing the grappling, and finished in dominant fashion. He got the nod via unanimous decision, but it was one that could be widely speculated. Sage did go unscathed, but aforementioned, work is to be done. If he kept that fight on the feet, it would have been easy pickings - some better decision-making and takedown defence would have lead to just that. Former Bantamweight champion TJ Dillashaw then avenged his 2013 loss to Raphael Assunção with a strong victory, wining all three rounds according to the judges. Coming off a defeat to Dominick Cruz, where he was forced to surrender the belt, Dillashaw's technique and movement was crisp to outwit the Brazilian at each corner. He started the fight by working around his opponent, circling with fast footwork, coming in and not getting hit when leaving the exchanges. Assunção was being baited in by the former champion who dropped his hands and waited to counter. Late on in the round, his head kick was however caught, but Dillashaw kept his composure in the scramble to come out unscathed. Things became more wild towards the end of the five minutes, with the Brazilian beginning to land more, although TJ was in control. There were some grappling exchanges to begin the second, before Dillashaw sent a right hand straight down the pipe, another example of his swift and intelligent counter punching. Anything that Assunção did, his opponent saw coming to either move out of the way or block, while he equipped some unusual techniques of holding his hands high out for him to hit, and opening another avenue to counter. 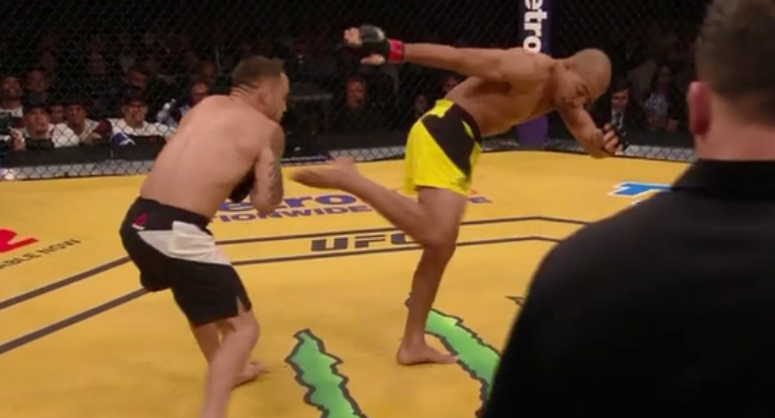 More leg kicks were thrown too, along with fluid stance switches as momentum grew in the corner of the former TUF finalist. The only time Assunção wasn't really up against it was when the referee momentarily stopped the fight to get a doctor to check his nose. Even on towards the final round, a smiling Dillashaw continued to move in and out at ease, with a late takedown and further control all but raising his hand. Perhaps had this been a main-event of five rounds, he would have went on to finish him as he did with Barao, the movement was clinical. Whether or not its again up to the level of Cruz will be seen should the pair engage in a rematch. Kelvin Gastelum followed with a unanimous decision win over former champion Johny Hendricks, over the course of a fight largely contested on the feet. Both men adopted southpaw stances for the fight, and it was the TUF winner who applied pressure early on. 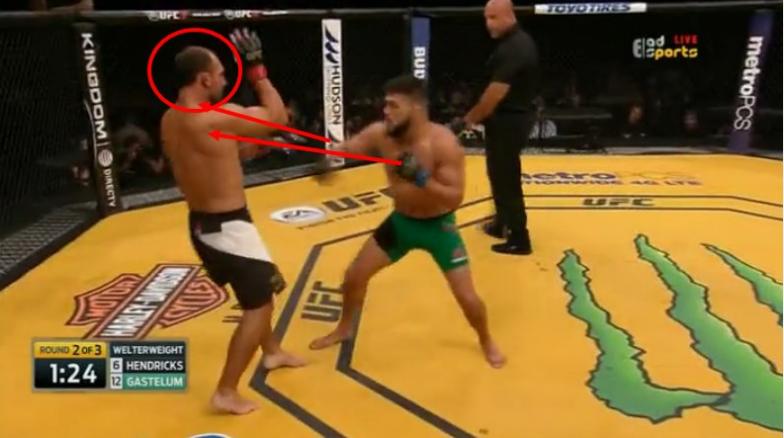 While they exchanged central position, Gastelum posed far more danger when he moved forward, nailing 1-2s time and time again with the jab followed by the straight left hand. Just a few minutes into the fight and "Big Rigg" would begin catering to his nose, whether that was a result of the shots he'd taken to it or just a cold is questionable. The leg kick was also there for Gastelum, with Hendricks appearing very slow to move his head off the centre line. He did remain respectful of his opponent's power, though, clinching just before he managed to land a clean overhand. With 2 minutes remaining of the first frame, Hendricks was in trouble, but managed to make it to the end of the round. Johny Hendricks continued to look sluggish throughout the fight, and was too slow to really fire anything back and get out of the way. That could have been a consequence of the weight cut - his issues are well documented, and he did miss on the scales albeit by a fine margin. Other than his late flurry to end the first round it was one-way traffic, until he initiated the clinch after catching a kick in the second. He was unable to truly employ his wrestling game though, with Gastelum getting out - and any time he did get combinations together, they were always when his counterpart was moving backwards. Trading of shots was more open, but the final result was always the 6th-ranked Hendricks trying to get the double under hooks. In the latter stages of the second round, Gastelum also worked the body, creating more problems. Another frequent observation was Hendricks' running to get back out of danger. Many believed that in the Cormier vs. Gustafsson title fight back in October, that's exactly what would cost the Swede in his title bout. As Gastelum closed him down, he ran to the side to get back into safety - something that probably didn't sit well with the judges. His energy was further depleting as he went to load up on strikes, also telegraphing it in the process, which - combined with a very tough weight cut - made easy pickings for Gastelum. Hendricks tried to land a takedown late on, but couldn't keep him down, and both traded it out for the finish. It's a big win for the man dubbed as "Mini Cain", but Hendricks needs to look in the mirror - his time at Welterweight could be over, the weight cut made him perform terribly at UFC 200. In the featured preliminary bout, Julianna Peña scored a huge victory over previous title challenger Cat Zingano, moving her one step closer to a shot at the Women's Bantamweight gold. Unlike her 14-second submission loss to Ronda Rousey back at UFC 184, "Alpha" came out far more composed and controlled to open the fight, waiting her opportunity before getting into the clinch up against the fence. She soon found the takedown, although her nemesis would get back up, before being taken down again. After more aggressive clinch work, Peña then took her down, before Zingano got back on top in the full guard. "The Venezuelan Vixen" did well to grapple defensively on her back, keeping the legs wrapped and actually slapping her opponent on the head to deter her of any guard passes. To close out the round, Peña tried to work her way back up but almost ended in a choke attempt, with some late clinching where the TUF winner excelled; although it wasn't enough to sway the round in her favour. Zingano used a similar strategy to take the fight to the ground at the start of the second round also, landing a combination before surging towards Peña, forcing some more defensive grappling. A modified belly-to-belly suplex after the fight was stood up gave Zingano some more control although an excellent transition would allow her to get back on top, using her physical prowess to great advantage. She did more work in top position, almost finding a face crank but Zingano scrambled to the sprawl. But soon enough, Peña worked her way to taking the back of Zingano - and began to close in on a rear-naked choke attempt. However, with around half a minute remaining, Cat was content to defend well and see it to the end of the round. The fight would quickly hit the mat once again to start the third round, with Peña on top this time. She had a lot more urgency in trying to do damage with short elbows and punches, knowing that it was a round apiece by all means of conventional judging rules. She just seemed the far more stronger fighter, able to switch to side control by evading some up kicks and further putting things in her favour. 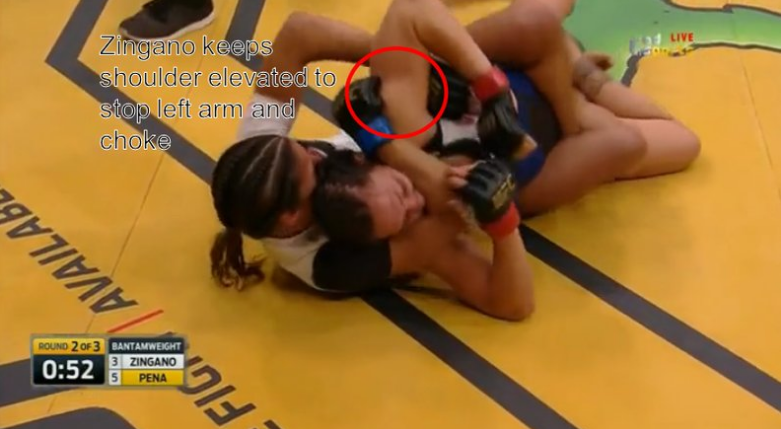 Soon enough there was another neck crank attempt, after working her way to take the back, but with both drained they continued to work for position, ending with Zingano on top. However, Peña was the clear winner and the judges agreed. It was a gruelling fight, with both eager to grapple - however, Zingano may have been better suited to striking with her opponent in the opposing stance, opening up for the left kick all day long. Kicking off the main card, Cain Velasquez bounced back from his loss of the Heavyweight crown dating back more than a year ago to finish Travis Browne late in the first round. With his legendary cardio pushed beyond its limits when he was submitted by Fabricio Werdum in Mexico City, he was operating at full capacity back at sea level in Las Vegas - and looked better than ever. With Travis Browne enjoying a distinct height and reach advantage, the former champion was eager to close the distance early, and did so by applying pressure and taking the centre. He landed a shot right off the bat and also ate one for his efforts, before looking to land some leg kicks. They indeed had an early effect, already limiting the movement of the taller Hawaiian. Velasquez began to cut the space, landing well with some jabs and moving his head away just in time. A minute into the fight and he had began to clinch. Pressed up against the cage wall, Velasquez landed some strikes including punches and knees to the thigh, but Browne was able to take it back to the middle of the Octagon eventually. There, he was guilty of loading up a little too excessively on his shots, with Cain relentlessly hunting him down. Then, with Browne backed up, he did something we had never seen before, a spinning wheel kick which caught "Hapa", changing the complexion of the bout. 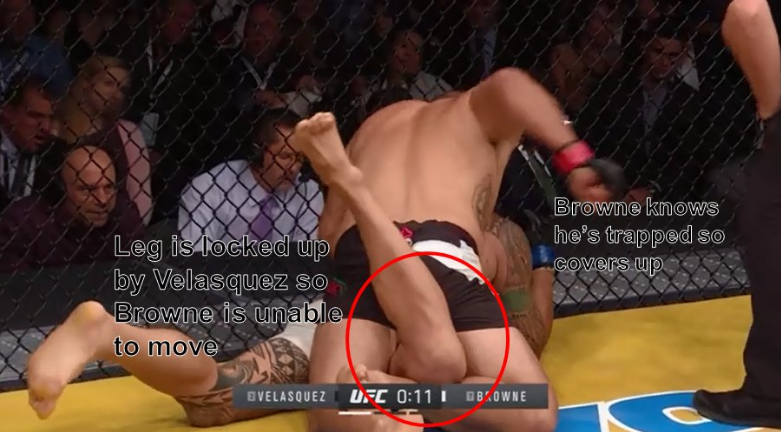 He began to track back, allowing Velasquez to unload, and as he moved to his side, he landed an overhand right which sent Browne crumpling towards the ground. He took top position, then moved to half guard for more punishment - just far too physically imposing for Browne to respond, and his constant pressure made openings to fire away. 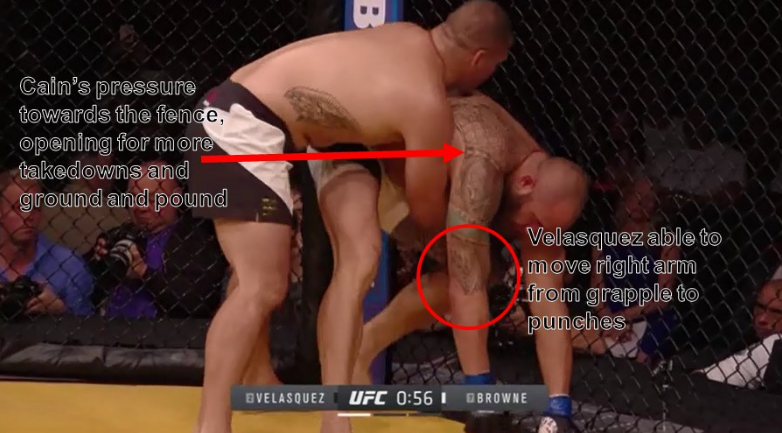 When things were eventually separated, Browne was still on wobbly legs, before Velasquez tried another spin. He got the takedown, and trapped him in a backwards half guard, pummelling away against the trapped opponent, and that was it, as the referee brought a stop to the fight. It was a complete performance by the former Heavyweight kingpin; who gave himself a very good argument to become the new number one contender for the gold. On the feet, he was fast and applied plenty of pressure, while when he got his hands on Browne, the result was inevitable. Jose Aldo captured the Interim Featherweight Championship as he outclassed Frankie Edgar to set up a potential rematch with Conor McGregor, following a five-round decision whereby the Brazilian thrived and dominated on the feet. Noticeably, the demeanour of Aldo was shades different to the nervous champion that awaited his bout with Conor McGregor back in December. Having a tightened up posture and feeling the pressure, compared with a smiling and more composed attitude, it must have made a difference throughout the fight. It also wiped off the questions that many placed about Aldo not being the same after the 13-second knockout loss. Aldo was cautious not to get tagged, keeping his hands high early on with the addition of the feinting right hand to open up for a leg kick. It would be Frankie Edgar, however, who started throwing the leg kicks in the early stages, unable to find his opponent any higher as he moved swiftly out of harm's way. The former Featherweight king was also looking to do to Edgar what McGregor did to him more than half a year ago; land a counter hook as he rushed forward. They did land but not clean enough. Frankie's first takedown attempt came about 3 minutes into the fight, a consequence of him unable to really connect other than a handful of leg kicks. But at ease, the takedown defence of his opponent was well established, with Edgar going for the single leg, but the Brazilian pushed off the mat and slotted it out safely in time. Both competitors went for a similar spinning attempt late on in the round, but it was Aldo who would benefit more, landing a jab then straight right which stumbled the American, finding his range towards the end of the first frame. Two knees were landed late on, before swinging wildly as the round came to a close. Frankie Edgar continued to push the pace to begin the second round, with more success coming from leg kicks, landing some just as his opponent exited the exchanges and attempted to pivot. Still, he continued to attack at straight lines making it easier for the Brazilian to counter or just get out of the way. The 34-year-old then went for a takedown, catching a knee and trying to get the under hooks, but it was all too easy for Jose Aldo just to whip him away and stand the fight back up. Frustration was beginning to set in for the favourite, who walked straight into a jab after, before trying a wheel kick, as he was met with a combatant who was beginning to become sharper, and improve as the fight wore on. As a result of the left hooks which Aldo used to counter the forward movement, Edgar had a cut on his right eye, a warning sign which he acted upon by aggressively chasing down the South American more frequently. But still, he was able to pivot, and circle - although may have gotten brushed by a few right hands. Another takedown attempt was stuffed of which Aldo easily defended, followed by one seconds later where "Junior" easily kept his balance, with desperation already showing on the former Lightweight king. There was some late optimism though when he staggered his opponent back with a right hand - until another takedown attempt was stopped. Jose was already coasting - with the template of the first two rounds essentially portraying the whole fight. In past five-rounders, we've seen Aldo fade and begin to slow down. However in this fight, he remained fresh, while it was Edgar who was beginning to falter. Nonetheless, the American was still able to land a number of shots, and after another blocked takedown, he controlled some of the action in the clinch - but Aldo remained disciplined and got it back on the standing zone soon enough. It appeared that everything which the Brazilian landed had far more effect; including a knee midway through the fight which stumbled his foe when looking for a takedown. After three rounds, Aldo had compiled a good lead in the fight - and in the championship rounds, both engaged in a war but nothing seemed to dethrone the ex-145 lbs king. 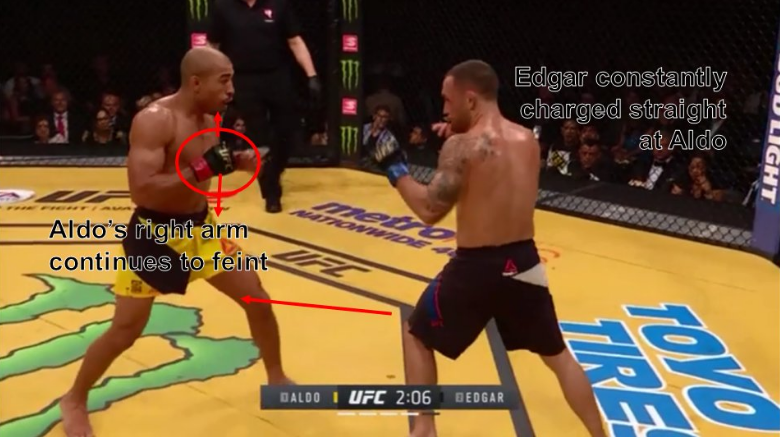 There was more of the same on tap in the fourth round as Aldo continued to strike away with more conviction, while Edgar landed a few body shots here and there. Some more takedown defence and a jab which lead to his opponent hitting the canvas put Aldo just five minutes away from becoming champion once again. In the final round, Frankie Edgar passed the 6 hour mark for Octagon competition time - but it wasn't experienced too comfortably. 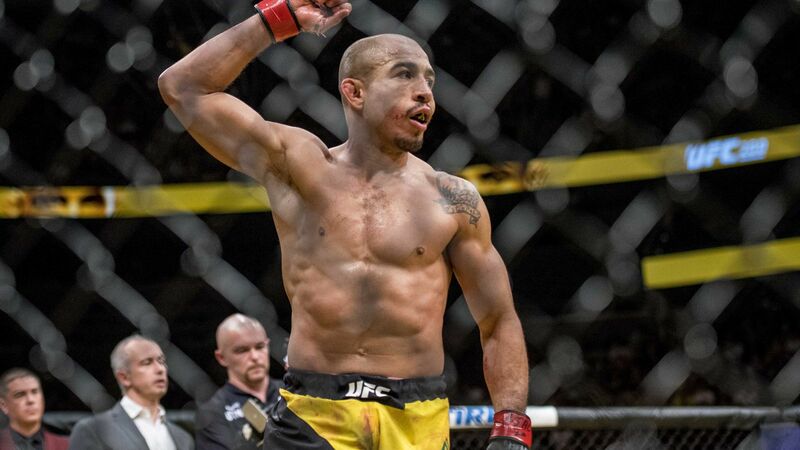 He continued to chase down Aldo knowing a knockout was needed, although one wouldn't come, instead eating a load of straight shots and hooks as was the case throughout the duration of the fight. Still, Edgar found some success late on, almost commanding his foe to brawl - but Aldo was too good at moving out of the way on each occasion and threw a knee late on. The decision was under little speculation; it was a world-class performance, an exhibit of counter punching, movement and takedown defence to halt the run of Edgar, and get him one fight back on the road to redeeming the gold he lost. Light Heavyweight champion Daniel Cormier ousted the greatest of all time, Anderson Silva, over the course of three rounds in a non-title bout after the Brazilian replaced DC's original foe in Jon Jones. While the fans in the sold-out T-Mobile Arena weren't happy, he got the job done. As is quite often the case, Cormier pushed the pace from the start, moving straight towards Silva with high pressure. "The Spider" circled around the cage and awaited his openings, throwing some jabs early on while the American pursued the overhand rights. A quick level change with the Middleweight backed up against the fence allowed him to clinch and get the takedown, where he was in full guard for a sizeable duration. He looked for the short elbows and punches in the tight gap as Silva held him down with a leg lock and wrist control, before managing to get one leg over in half guard. 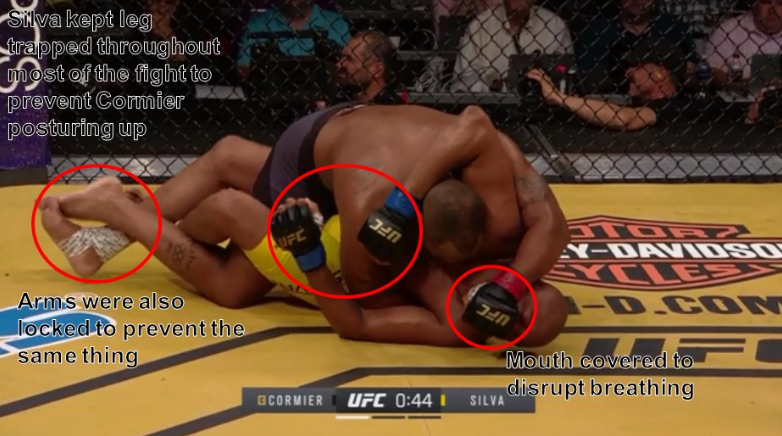 Another interesting tactic we saw throughout the fight was Cormier covering the mouth of Silva to restrict his breathing. Cormier did manage to get postured to strike away a couple of times, but Silva had to continuously grab him to stop further damage. Anderson began the second frame with more of his dynamic striking, from a leaping high kick to flying knee, but then Cormier caught his kick, and slammed him to the mat for more suffocating pressure. It wasn't all Silva's way when the fight was stood up though, because just before that, he was tagged by a powerful right hand. When the fight was back on the mat, Cormier was in side control, before half guard where he just continued to unload damage. Silva wasn't conditioned having taken the fight on such short notice, so could do little other than holding on and hoping for the best. After more of the same, John McCarthy stood them back up as a result of inactivity, much to the delight of fans in attendance. Silva was clearly drained as he back tracked, while an overhand was landed clean by Cormier again, but when Silva found the centre, he teed off with some big shots - although short lived as the American initiated the clinch to close out the round. Knowing a finish was needed to win the fight, Silva came out all guns blazing to begin the final round but would get dumped on his back yet again. It was more of the formulaic motion of the fight with Silva trying to hold while Cormier damaged, until with 2 minutes left on the clock, it was stood up once again. The Brazilian began to channel more of the skills which made him the best Middleweight of all time, circling round, then landing a body kick which hurt Cormier, although it was too late as he clinched for the rest of the fight. In essence, Cormier's gameplan was to hold Silva down for as long as possible - avoiding any striking exchanges, as we all know the danger that he poses. Although it was unpopular, it worked. 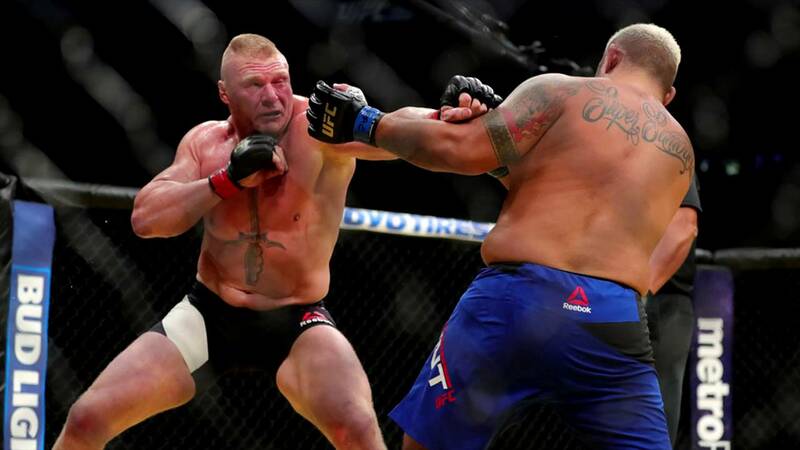 Brock Lesnar made his long awaited return to the Octagon as he knocked off the very durable Mark Hunt over the course of three rounds, in a fight where "The Beast" managed to employ his lethal ground-and-pound and avoid any huge bombs from the Samoan knockout artist. 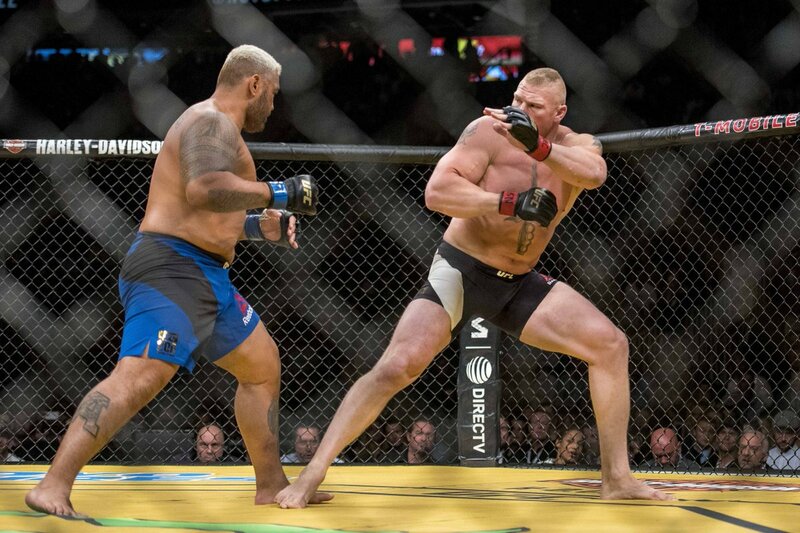 Clearly the bigger man, Lesnar's size was imposing and it would only be a matter of time before it shaped the fight. However, he was well aware of the power possessed in the hands of Mark Hunt, fluidly moving around like a Flyweight to avoid the shots and not allow him to plant his feet. Representing the nation of Canada, his palms were open to parry the shots that came in, while Hunt tried to feint and find an opening. Brock was playing with fire though, riskily moving into striking range with a quick stance switch to land a jab, and a leg kick, before getting out of the way as Hunt prepared to load up. 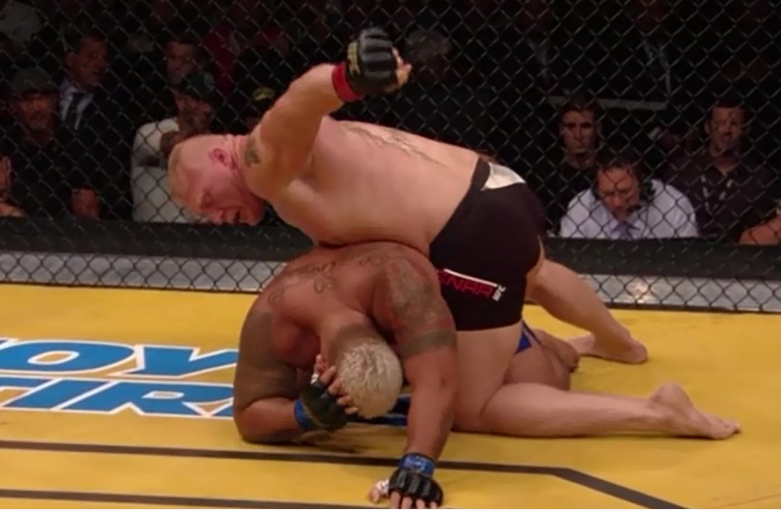 After slipping from a jab, Lesnar went for the takedown and wouldn't give up. He went for the leg, held on to it as he smashed Hunt towards the fence in typical Lesnar style - not phased by the danger before getting both legs and finding the early takedown. Hunt's takedown defence wasn't good enough to stop it, and found the opening for Lesnar who had such a large frame, it was hard for the New Zealand fighter to really manoeuvre into another position. Eventually he was in side control and then the same position with Hunt turned around, which is where most damage was done. 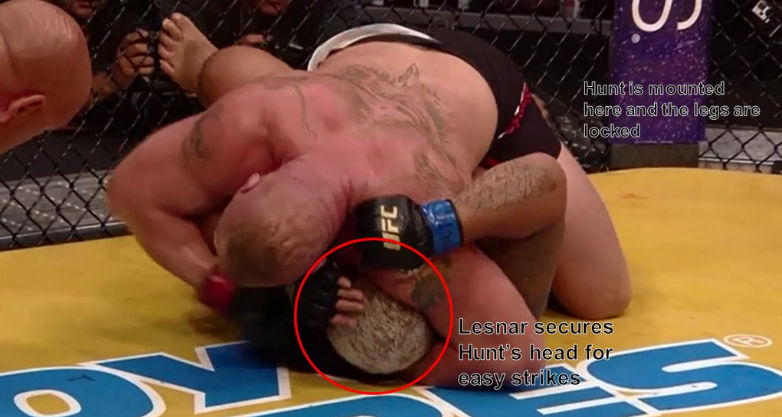 In this position, Hunt's legs were trapped and Lesnar could punch from either side of the face. With around half a minute, that above position had Hunt on the verge of being finished. Lesnar was reigning in the shots and he had no escape, eventually managing to better his position only to be taken down again. Brock was relentless in getting him back down, and while Hunt tried to sneak in an uppercut, the attempt was futile as the first round ended with similar melee. 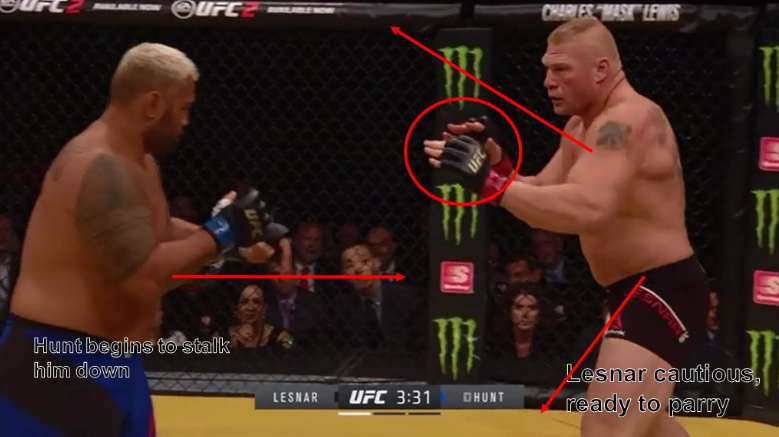 Mark Hunt continued to control from the centre, while Lesnar tried to find ways in as he circled. He sneaked in a few jabs here and there, with his speed advantage allowing him to pop shots at will. Whether Hunt was loading up a little too much or gun shy, he hadn't done enough work - and when he did Lesnar was their to block or move. Both men were guilty of telegraphing their actions midway through the second - the experienced Hunt tensing up a little too much before he threw, while Lesnar's level changes were obvious allowing the sprawl. What gave him a lot of success was not allowing the "Super Samoan" to get crisp combinations together, any time he threw one, the WWE superstar made sure he was disrupted by a block or transition out of the pocket. With Hunt adapting to stuff more takedowns in the second frame, the former Heavyweight champion was forced to level change as his opponent threw overhand shots - but he was still there to stop them. Lesnar finished by applying pressure towards the fence but did take some punches in that round too, a left hook and a handful of jabs most notably. A stiff jab to start the third round followed up by a takedown, with more dominant control and ground and pound put Brock just minutes away from victory. He continued to beat up Hunt who was trapped under his gigantic frame, and that was really the story of the final round. The size, the stature and the power of Brock Lesnar was just too much. Ring rust granted, just a few adjustments and he can excel in a potential second UFC run. As for Hunt, it was a valiant effort, but he was just unable to land on his gigantic opponent. After all that action, just one more fight remained of the historic pay-per-view. Amanda Nunes shockingly submitted Miesha Tate in the main event to win the Women's Bantamweight crown, after lighting up the American on the feet. The champion started the fight as she normally does, with her hands out, moving awkwardly to try and start grappling. But it was Nunes who looked more comfortable in striking range, just by observation. She landed a stiff jab and hook which Tate just walked into, and then managed to defend the takedown after being put on the mat for just a second, getting back up aggressively and throwing a hard right - boosting the Brazilian's confidence in more ways than one. Even in the clinch, she oozed confidence, managing to throw her off. But, what has went unnoticed is the potentially illegal knee she threw. It was illegal for sure - but whether it landed or not is the question. If it did, it would have had major implications on the fight, and it may have - with Tate going backwards after the shot. However, the jab thrown right before that landed right on Tate's nose - perhaps that was the beginning of the end for her title reign. Miesha Tate began to back up towards the fence, where Nunes tried some hard right hands, soon they began to land and then an onslaught followed. She stumbled to the ground, and got back up, but was under more and more punishment as the challenger neared to becoming Brazil's first ever female UFC champion. 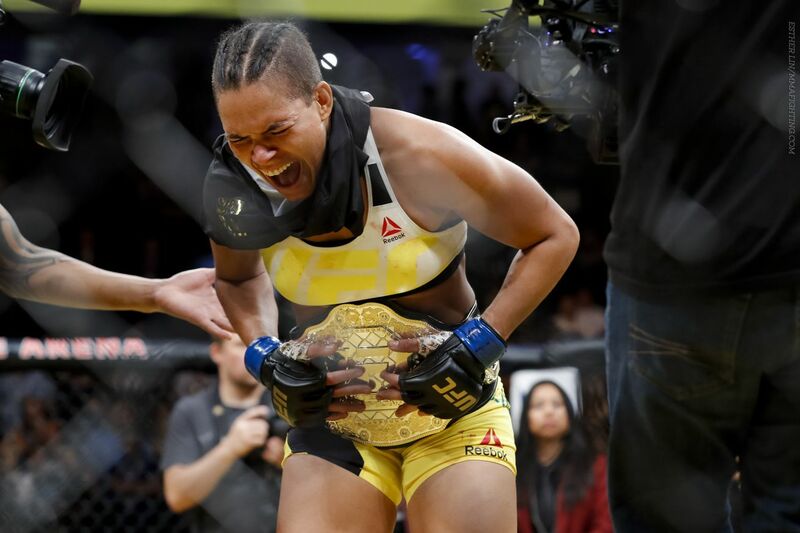 She took her back, and eventually locked in a rear-naked choke submission after more ground and pound, and that was it - Amanda Nunes became the new UFC Bantamweight Champion. It was a display of truly incredible striking. Miesha Tate went in to aggressively and didn't respect her hands, and paid dear consequences. She was blitzed on the feet, and then submitted at will on the ground, ending a historic night in unpredictable fashion - which is fitting, considering such moments have defined this sport. 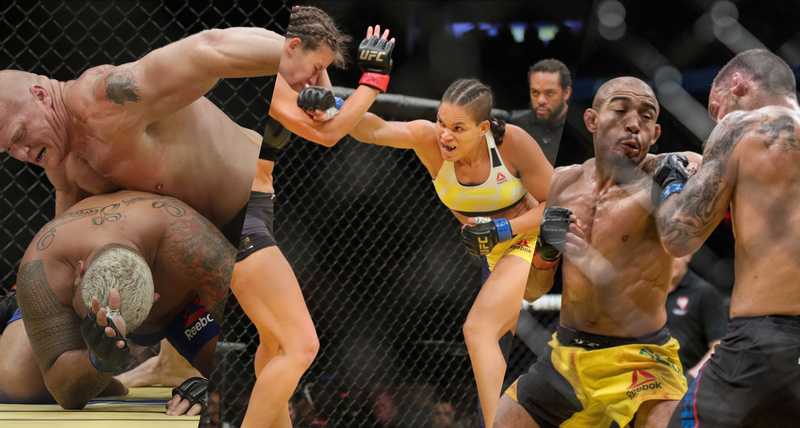 A complete mixed martial arts technical breakdown for UFC 200, reviewing each fight on the card by Nisar Khan, including: Tate vs. Nunes, Lesnar vs. Hunt, Cormier vs. Silva, Aldo vs. Edgar 2, Velasquez vs. Browne and more.